You use the Benefits Toolbox to create elements that represent and depict the opportunities identified in an architecture definition, classified according to their relative size, benefit, and complexity. The resulting Benefits diagram can be used by stakeholders to make decisions on selection, prioritization and sequencing of the identified opportunities. An Artifact to model the benefit of an opportunity identified in the architecture definition. (Key Performance Indicator) A metric used to define and measure progress towards achieving goals or critical success factors. The resulting end state of an event, decision or architecture process. A statement of an operation or activity that supports the outcome. 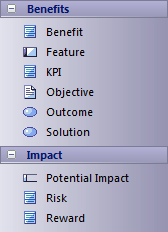 See the Help on the 'Impact' Page of the Business Motivation Model toolbox.